Join us for a reading group discussion of Selected Poems by Emily Dickinson! Displaying results 1-10 of 10 titles for "Billy Collins"
Join us November 14th at the Poetry Foundation! The Book Cellar will provide copies of The Gorgeous Nothings: Emily Dickinson's Envelope Poems in an event with the book's editors, hosted by Catherine Halley, Director of Digital Programs and editor at the Poetry Foundation. The "belle of Amherst," Emily Dickinson, attended Mount Holyoke Female Seminary for a year, but otherwise seldom left her home and had few visitors. However, she maintained a wide correspondence and spent much time with her nuclear family, who also provided her with intellectual companionship. Shakespeare, the Metaphysical poets of 17th-century England, the Bible, Transcendentalism, and her conservative New England background were all major influences on her poetry. Miss Dickinson was an extremely prolific poet but was not publicly recognized during her lifetime, publishing fewer than a dozen poems. She died at age 55, possibly of chronic kidney disease. After her death, her family discovered 40 handmade books containing nearly 1,800 more poems. The first volume of her work was issued in 1890. Today she is considered one of the most important American poets. 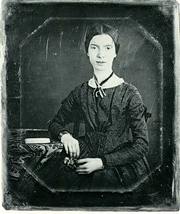 » Emily Dickinson's legacy profile. Emily Dickinson's book The Art of Losing was available from LibraryThing Early Reviewers. Emily Dickinson is currently considered a "single author." If one or more works are by a distinct, homonymous authors, go ahead and split the author. Emily Dickinson is composed of 20 names. You can examine and separate out names.